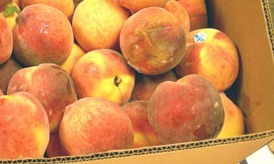 I bought 10 pounds of bruised peaches from the farm stand today. Five dollars, AS IS. I knew it meant a good hour that evening of peeling and excising the moldy brown spots, and I started to walk away. But I also knew that if I carried them home I would get to feel for a moment like they were peaches from my orchard that I will unfreeze this winter to make cobbler and remind myself of what summer tastes like. And it would be five more dollars for the farm. I love peaches. I love a good deal. I love salvaging what other people walk by. And I love buying from places like Boley’s farm, which is a historic landmark in the middle of our suburban, strip mall-scarred landscape. A huge red barn full of fresh produce, local honey, and, in the fall, pumpkins from the adjacent field. Everything was “local” when I was growing up. The nearest “chain” store was a 20-minute drive away. I would follow my mother up the painted steps of Batterman’s grocery, one of the two in our small farm town, and while she chatted with Mr. Batterman over cuts of meat, I skated over the wood floor in my gym shoes, feeling for the dips and wishing I had a marble to test how far it could roll on its own. I still love the smell of two-by-fours, a scent that takes me back to the lumber yard where my carpenter father would go for supplies and stay longer than necessary talking with his best friend Bud, the owner, before we’d hop back in the truck and park just down the block at the only barber shop. I’d sit in the plastic chair waiting for my father and little brother to get trimmed, knowing my reward was a piece of Bazooka Joe bubble gum and a Dum Dum sucker that Corky would hand me even though the only time he touched my hair was to give my long braid a goodbye tug. …And the farmer’s wife, weathered as the painted sign outside the barn that reads “Closed Sundays,” who picks up four fresh peaches in each hand, places them in my box of AS IS fruit, and says, “I’ll give you a few extra ones.” The lady at Wal-mart never says that. Love! And I agree. Local is about people and genuine caring and quality. Authentic. Just like you, my friend. Love you. Ah, my faithful reader and friend. Thank you! Very evocative writing. I feel like I was there too. I appreciate your reading and your thoughts on the subject. http://www.littlegumnut.blogspot.com/ And speaking of mum-made, I sold crafts for a while then started a mural business (also hand-painted furniture), so I appreciate your current journey! Thanks, as always, for reading, Melanie. Do you have a favorite “local” spot? Wow, good stuff Amanda. Great ending!